In Charleston? Need cocktails? Find The Gin Joint. Recently, I paid a visit to Charleston, which has established itself as a culinary Mecca in the South — James Beard Award-winning chefs, fresh seafood, classic southern dishes, and more than a few microbreweries dot the city’s foodscape. 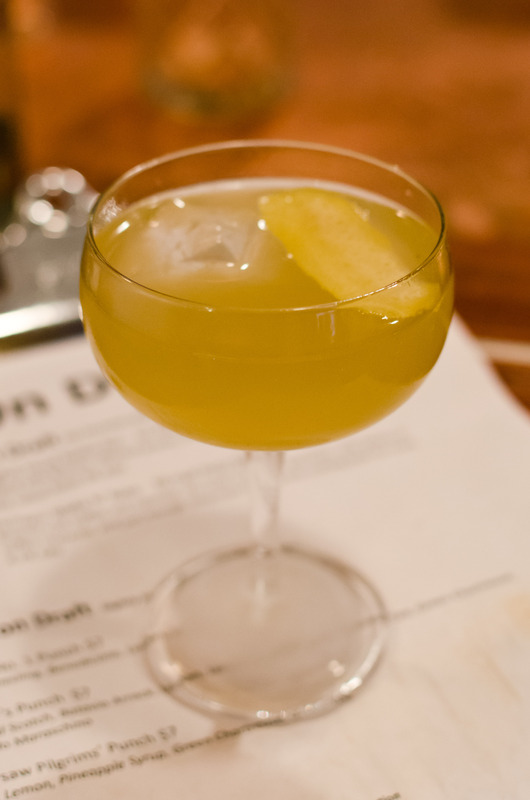 While the city frequently boasts more churches than bars — earning its “Holy City” moniker — it nonetheless has an excellent, if small, selection of bar and cocktail programs. The Bar at Husk, now housed in its own renovated space adjacent to the restaurant, is reportedly excellent — and I didn’t make it there. (Side note: I did lunch at Husk, and sampled their excellent Queen Street Punch — the full drink menu is always available at the restaurant. Also, peeking in the window, I noticed that they had a few bottles of Pappy Van Winkle on the back bar). McCrady’s, the two hundred year-old tavern in an alley in the old part of town, cannot be matched in terms of class, service, and quality — and I didn’t make it there, either. So — no Husk, no McCrady’s — where did I end up? 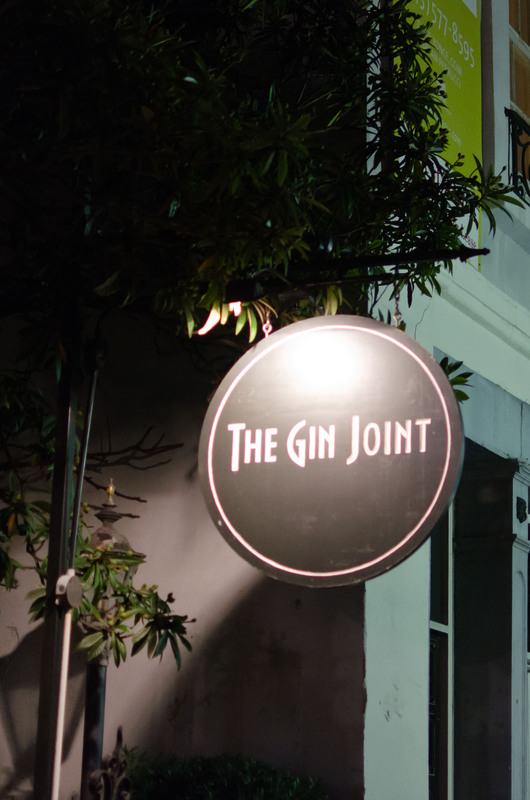 Well, the third of the trio of Charleston’s cocktail bars is The Gin Joint, and that’s where I spent my introductory night in the Holy City. Tucked away on a lower floor down a small walk off of East Bay Street, the bartenders at the Gin Joint are busily mixing up some of the best craft cocktails around. 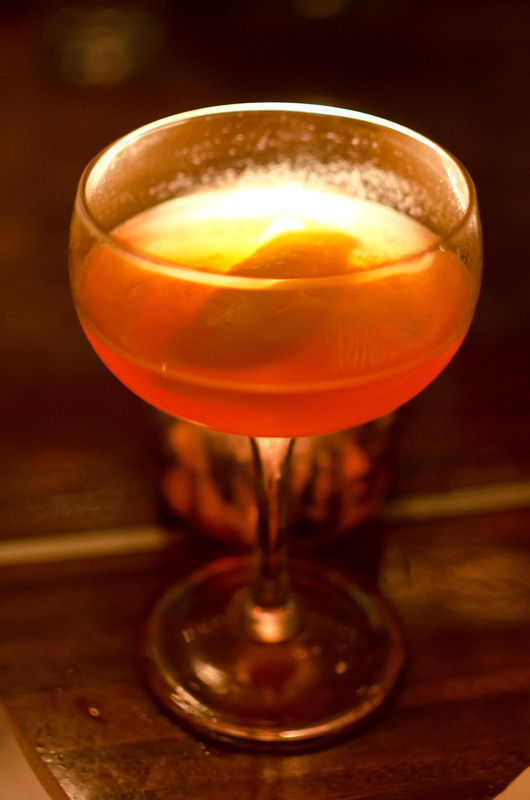 You can get everything you’d expect from a place with a speakeasy-esque name, from (Pre-) Prohibition classics (not on the menu, as usual, but they know ’em all) to inspired new variations. The selection stacked along the back bar reaches to the ceiling — the bartenders frequently have to hop on top of the counters to pull down the top shelf stuff, which is some of the best booze around. An absinthe fountain lies stealthily in the corner of the big, round, corner bar, and bowls of punch sit cooling under the bartop, a refreshing glass ready to be served out at a moment’s notice. 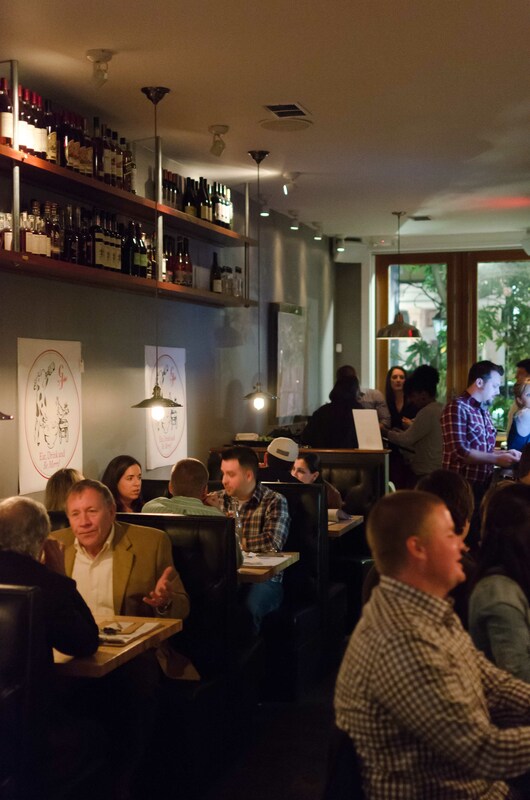 The atmosphere is casual, comfortable, and moodily lit by neo-Edison lights. Business was brisk and bustling on a Friday evening just after the 5 o’clock opening, but it’s not a noisy (or noisome) kind of place, except when twin shakers are being worked. Playing host to our cocktailian whims that night was bartender James — he was the one leaping on countertops to get to the high-dollar bourbon and scotch. Speaking of scotch, a bottle of Laphroaig 10-year — used for rinsing glasses, mostly — was sitting out on the bartop the whole time, peatily perfuming the atmosphere surrounding the bar. Anyway — to the drinks! I needed something refreshing and light after hiking around South of Broad that afternoon, and the Hunter’s Punch fit the bill: it’s a blend of scotch, arrack, lemon, oleo-saccharum, green chartreuse, and green tea that has a nice, crisp, acidic edge to it and some funky herbal tastes playing around in the background. Oh, and it’s fizzy — there must be some champagne or soda lurking in there. As I mentioned before, the Gin Joint has three or four punches mixed up any given day, lovingly ladled out for $6-8 a glass (not a bad deal, as far as cocktails go). 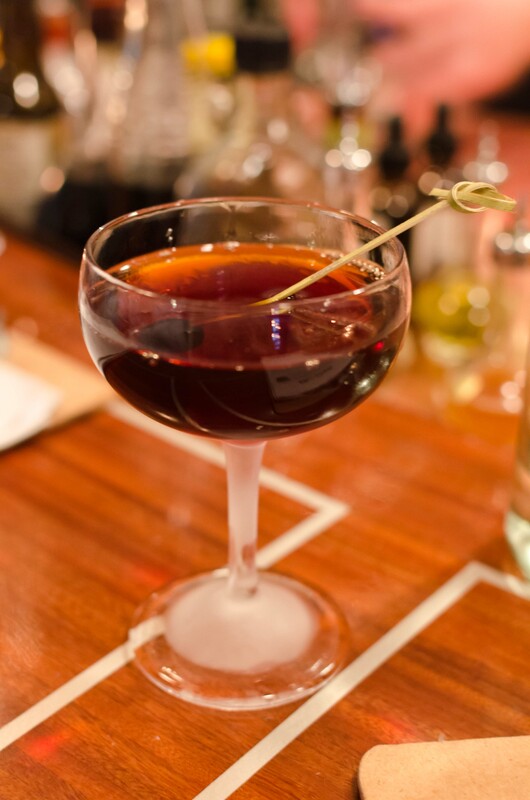 For his first round, my friend Neil asked James for something similar to a Manhattan, but not — he was rewarded with a drink that was making the rounds a couple of years ago, the Black Manhattan, a variation that replaces the sweet vermouth with Averna, a bittersweet Italian amaro. Dark, savory, and always delicious. 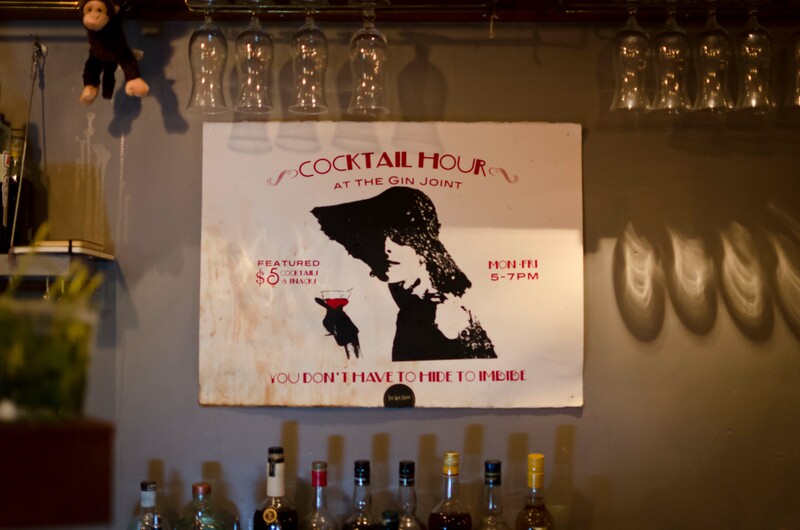 On their menu, the gin joint has a -roll-your-own sort of section, wherein you can pick any of two categories — spicy, vegetal, herbal, strong, refreshing, etc. — and leave the rest to the bartenders. I love to see this on a cocktail menu: it’s a great way for people to experiment or wind up with exactly what they want if nothing on the regular list catches their eye. 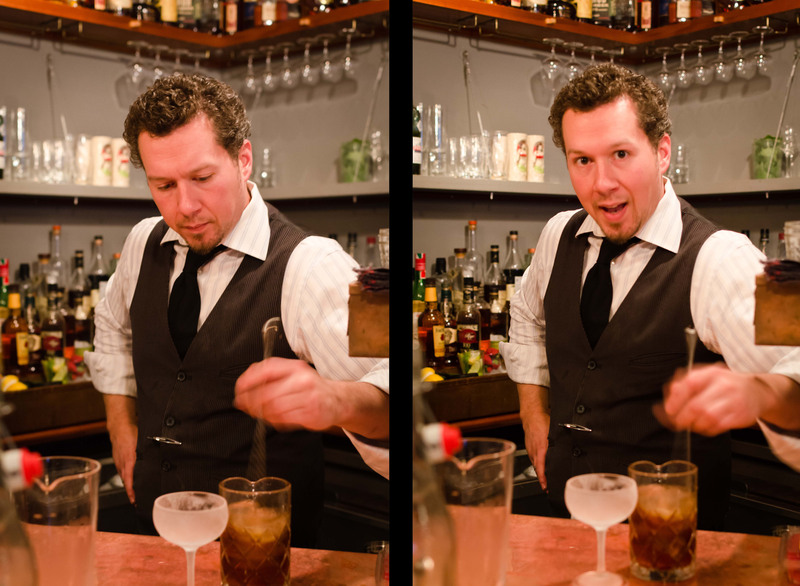 Plus, it gets bartenders to show off their skills, starts some fun conversations, and get to know their customers better. Making use of this system at my suggestion, Neil went with Spicy and Refreshing, with a hint of vegetal. End result? 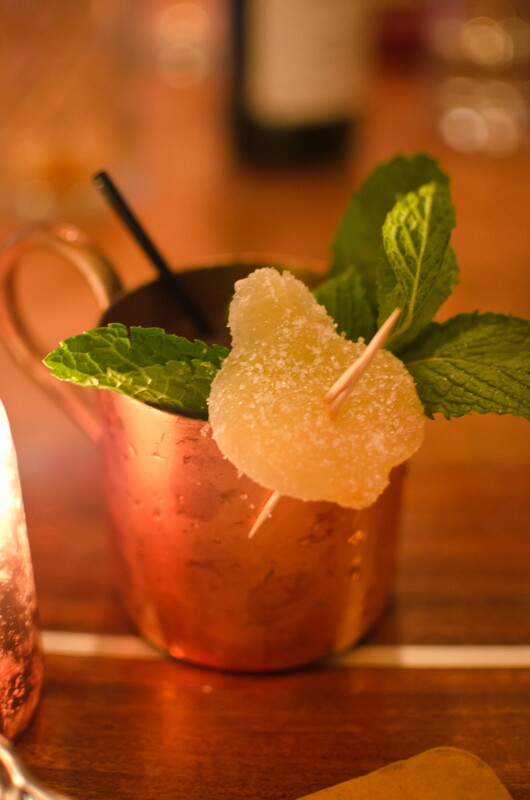 Another modern classic — the Mezcal Mule, Audrey Saunders’s take on the Moscow Mule. Made with mezcal, lime, housemade ginger beer, and a hint of habanero sauce, the Mule is citrusy and refreshing, but has a hot, gingery kick that catches you as you swallow. Following along with the Choose Your Category system myself, I asked James for something tart, along the lines of a punch, that involved Laird’s Bonded Apple Brandy. Out of the shaker came a Jack Rose — always a classic — with a couple extra dashes of Angostura bitters. The drink came out much the same way I make them at home — maybe a little easier on the brandy, which is nice, as the stuff can get rough — but the addition of bitters was nice touch, bumping up the depth and spice a wee bit. We were well on our way through Happy Hour at this point, and the place was filling up. A second bartender had come on duty — much to James’s relief, I imagine — and we had just polished off our appetizer of stuffed fingerling potatoes. The two pairs of travelers on either side of us — also, by coincidence, from Atlanta, and quite familiar with Holeman & Finch — were busy peppering James with drink questions and remarking on what another coincidence it was that he was from Marietta. Not quite wanting to leave and seek out dinner, however, Neil and I each had a final drink. Curious about the peaty smell wafting around the bar — that tempting bottle of Laphroaig — Neil asked for a small taste. 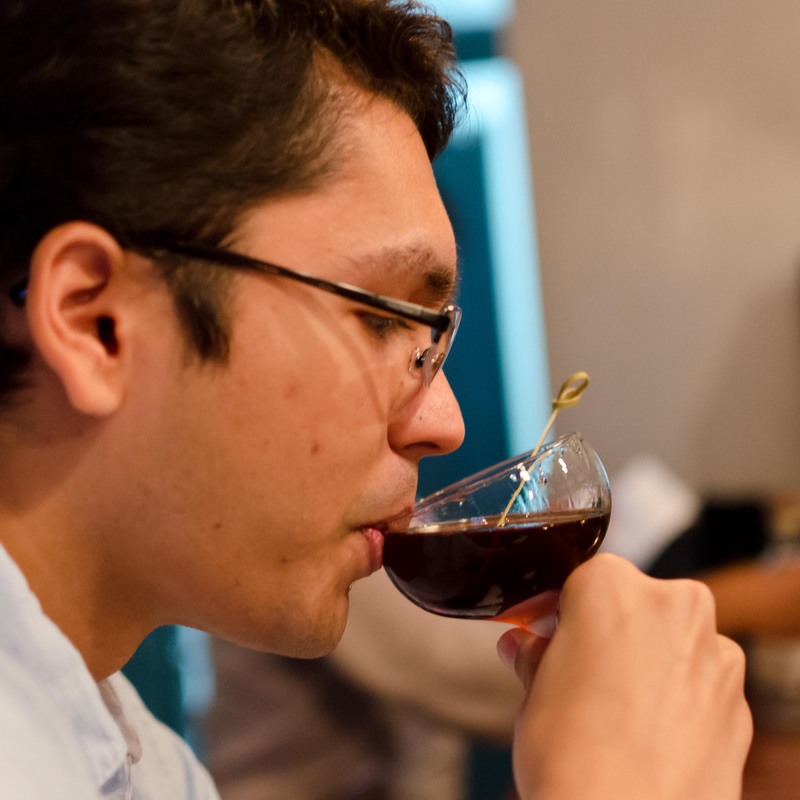 “Yeah, I can see why you’d drink this with a bit of water — I know that I’d have to.” I tried a sip — good, but it doesn’t match the Cask-Strength 10 year, which has a much deeper, more interesting flavor. As for me, I had spotted a bottle of Laird’s 12-year Apple Brandy sitting midway up the shelves. Never having seen it before (nor, of course, tasted it), I chose a flight-sized pour of it to cap off the night (you can order flights, to sample, or full pours — a nice touch). Wow. As good as an XO armagnac, and better than a lot of cognacs. Laird’s 12-year has a nice, polished sensed of age to it, and tastes predominantly of fruit — as a French brandy would — but with a lot of the soft caramel and oak notes you find in wheated bourbons. The Laird’s 12 is not nearly as sweet as the 7-1/2 can be, and it certainly isn’t gruff and tough liked it Bonded sibling. 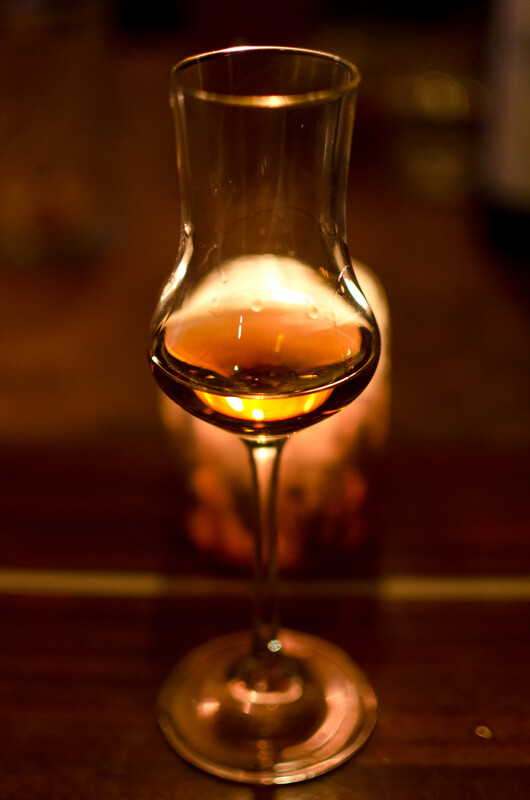 I call it a “calvados-equivalent”…time to track some down. Full of good booze and prepped for food, Neil and I made our farewells, shook hands with James, and wound our way through the tables and out the door into the nighttime chill. Strolling down the cobblestone sidewalks and joking about the price-less (and therefore unaffordable) menu posted on the side of McCrady’s, Neil and I began the hunt for dinner, deciding to revisit the Gin Joint on my next time up. Not a bad start to a tour of the Holy City — not bad, at all. Was a blast, you definitely need to come back! This entry was posted on March 6, 2013 by IJ Lauer in Bar Visit and tagged black manhattan, charleston, cocktails, hunter's punch, jack rose, laird's 12 year, review, south carolina, the gin joint, visit.